Atoll is an open, scalable, and flexible multi-technology network design and optimization platform that supports. The Atoll working environment is both powerful and flexible. 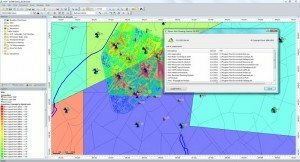 It provides a comprehensive and integrated set of tools and features that allow you to create and define your radio-planning project in a single application. Atoll includes advanced multi-technology network planning features (e.g., CDMA/LTE), and a combined single-RAN, multi-RAT GSM/UMTS/LTE Monte Carlo simulator and traffic model. You can save the entire project as a single file, or you can link your project to external files. The Atoll working environment uses familiar Windows interface elements, with the ability to have several document windows open at the same time, support for drag-and-drop, context menus, and support for standard Windows shortcuts, for example, for cutting and pasting. Atoll not only enables you to create and work on your planning project, but also offers you a wide range of options for creating and exporting results based on your project. The working environment provides a wide selection of tools to facilitate radio-planning, such as a search tool to locate either a site, a point on the map, or a vector. Here is a Screenshot of Atoll with opened GSM Project.